I must say, capping the season with a clobbering of Colorado and winning a bowl game against the likes of Michigan have almost made all of the recent suffering worth it. It was interesting to see all the predictions beforehand about who would win this game, and how much certainty there was that Michigan had better talent, Nebraska would be lucky to keep it close, blah, blah, blah. Before the Alamo kickoff, ESPN pundit Lou Holtz said something odd about how the Nebraska program is in trouble because we've recruited more junior college players recently. Call me crazy, but I'm thinking it was a good thing we had Zack Bowman (just to mention one name in particular) in a Husker uniform for this game. Or Zac Taylor (to mention a second). Of course, I could also mention all of the non-JC recruits that made a difference this season. But I wouldn't want to confuse Lou. It must be hard filling Trev Alberts's ESPN seat. I have a confession: I think I almost "forgot" how much more I enjoy bowl season when my team is involved in one. And all the better, when they come out on the winning side. Too bad every game can't be an Alamo Bowl. Ross is a special player and he proved it resoundingly over the last two games. Not many backs get 100+ receiving yards in one game, then over 100 yards rushing the next. Sometimes there are players you wish would never leave. Ross is one. I'm eager to see what Lucky can do next year, but I'll always be a Corey Ross fan. How can you not admire a kid who has the good sense not to attend CU, and then accomplishes everything that he has on the field over the course of three different offensive coordinators? His two games in Boulder (2003 and 2005) were epic. The bizarre ending of the Alamo Bowl shouldn't diminish what NU accomplished. (I have to wonder if the national media's fascination with the final play wasn't at least partly because the team they presumed would win the game "almost" pulled it out.) All told, Taylor and Ross showed incredible grit. Our offensive line did just enough in the pass protection department to win. When we have several years recruiting under our belt for offensive lineman-particularly tackles-that better fit this offense, we have the chance to do great things. It will be interesting to see what having Herian back can do for the offense next year. We played an entire season and won eight games (and barely lost two others) with no meaningful receiving threat from the tight end position. Of course, there were some negatives this season. The team that lost to Kansas and the one that beat CU and Michigan aren't the same team. Which one represents the "real" 2005 Nebraska? I can't say for sure, but I do know this: In college football, it's how a team finishes the season that counts the most. Husker fans have a lot to be thankful for. Miami lost their bowl game by 37 points; Tennessee didn't even qualify for one. Michigan lost theirs to a team most national pundits said they should beat easily. Poor Lloyd Carr�cry me a river. In the final analysis, this was a good year not to win the Big 12 North. Nobody in college football beat the South champion. We beat the North champion 30-3. The 2005 Huskers will go down as non-division-winners, but we will also go down as the only North team to be ranked at the end of the year. (Kansas got 2 votes for the final poll spot, and Missouri 1 in the AP. Woohoo.) Other than Texas at the top, there was quite a gap before the rest of the ranked Big 12 teams. Both Texas Tech and Oklahoma were fortunate to beat us this year. Both are gone from the schedule next year. Yes, some of the losses this past year were ugly, and a couple of the wins unpretty. But the Huskers are in very good position to win the North next season and again be ranked. Consider that new coaches and new systems will be in place at Kansas St. and Colorado, while Missouri (minus Brad Smith) and Kansas both come to Lincoln in 2006. Iowa State looks like our toughest competition. This is admittedly conjecture, and admittedly early--but hey, that's one of the things we do here in the out-of-control, unchecked world of internet commentary. After all, we don't seriously expect to rise up and challenge the phenomenal accuracy of the traditional media's college football experts. Hopefully by fall the Huskers will have a healthy Octavien, Bradley, Ruud, and Herian back. Another spring for Taylor, plus the addition of a few more recruits (whether from the JUCO ranks or HS), and significant contributions from some of this past season's talented redshirt players�and 2006 could be an exciting year. If we build on the way we ended this season, we have a great chance to get back to the Big 12 title game where we belong. Thank you, my friends, for reading the Scarlet Commentary this past season. The voice of Scarlet Commentary is Jeffrey A. Leever, a Nebraska native also stuck behind enemy lines in Jefferson County, Colo. 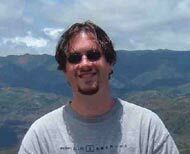 He is a 1994 graduate of the University of Nebraska (Kearney) and a freelance writer and author. Some of Jeff’s writings of the nonfootball kind can be found online at Barnes & Noble (1, 2), Amazon.com (1, 2), and MenofIntegrity.net (1, 2, 3, 4, 5). Contact Jeff at splasheditorial@hotmail.com.